Rubrik is a winner and HPE a loser in Gartner's latest beauty contest for data centre backup and recovery suppliers. What do we see in this latest edition? Two obvious things. First, HPE has fallen back into the boring old lower-left niche player's box from its year-ago challenger status, largely by having its ability to execute deteriorate. Secondly Rubrik has appeared for the first time, in the lower-right visionaries' quadrant. The Gartnerites say: "Despite being a new entrant to the market, Rubrik has generated heightened market awareness and rapid adoption by upper midsize to large enterprises, augmenting or completely replacing mainstream data center backup solutions." 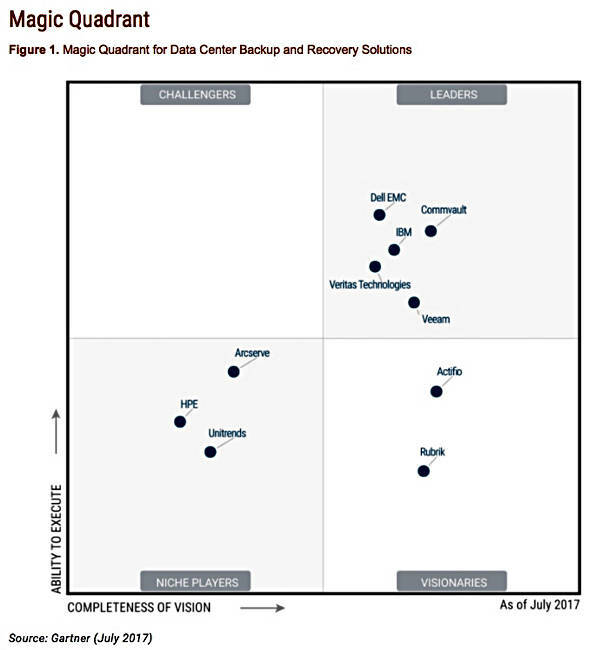 Commvault was a clear leader in the 2016 MQ. This year Dell EMC and IBM have cut into its lead. Generally speaking, the other players in this MQ have only seen minor changes in their positioning. Veeam CEO and president Peter McKay would not agree with this view, claiming: "Our upward movement to the right is the biggest advancement in both Vision and Ability to Execute, outpacing our competitors as we drive ahead as the leader in Availability solutions for the enterprise with multi-cloud." Yeah, yeah, Peter. Give it a rest. Rubrik wants us to know that it's the fastest time that a company has made it from founding into this MQ in Gartner history. HPE's change in position is impressive, for the wrong reasons. Gartner's researchers say HPE's "Data Protector is rated lower than other vendors in this research for the lack of innovation and execution compared to major competitors." They add: "HPE does not offer socket or VM bundle-based pricing, and references cite dissatisfaction with packaging and pricing." Some work to do there then. Hey, HPE, how about buying Rubrik? Arcserve has fallen back a bit too, and needs to work hard to recover its previous status. In Gartner's introduction to its MQ, the researchers write: "Exploiting converged data management (also referred to as 'copy data management') has become important; here, backup data is leveraged for additional use cases, such as analytics, disaster recovery, test/dev, reporting and so on."